Complimentary copy from Waterbrook through NetGalley. Well. I am not an expert on Daniel, but it appears to me, this author did her research and did a commendable job presenting the Biblical story. It took me a long time to read this book ~days! So, I recommend that if you choose to read it and I do recommend it, you allow yourself time. The story is set in 6th century Babylon, so the culture is different. It might take a couple of chapters to become accustom to the names of the characters in the story, although there is a character list in the beginning of the book. I do believe this is a clear story about the faithfulness of Yahweh to his people and Daniel’s strong faith in his God. Daniel’s faith gave him the courage he needed to face any experience while in captivity. I especially liked the author’s telling of Daniel in the lion’s den. Daniel’s faith inspired me to face difficulties with courage! The story is well-written, however at times I thought the chapters ended abruptly. 4.5 **** amazing stars! I received a complimentary copy of this book from Waterbrook & Multnomah through NetGalley. Opinions expressed in this review are completely my own. 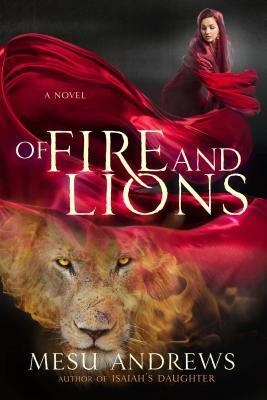 This entry was tagged #OfFireAndLions#NetGalley. Bookmark the permalink.